We offer groups of mixed animal skulls for sale. 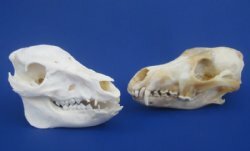 These animal skulls may include Georgia wild hog, North American coyote skulls, fox skulls, raccoon skulls, rabbit, chicken and many other North American animal skulls. These skulls have been cleaned and are ready for display. They are all real - NOT replicas and will have natural imperfections such as missing or broken teeth, scars, blemishes, scrapes, small cuts, etc.